Go to Azure portal, find storage accounts, and add another one (or repurpose an existing blob storage). Make sure to provide all the required information and select blob storage within the account kind option. Then, proceed to a newly created storage account and copy the storage account name and a key (settings –> access keys) as well as create a container which is going to be used for storing the data (blob service –> containers –> new). 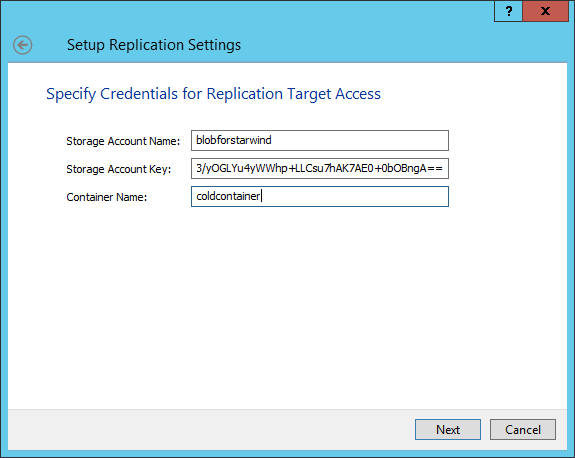 You’ll need this data later, when configuring a cloud replication in StarWind VTL. The purpose of such an action is to emulate a tape library setup on a desired server, so Veeam is going to send data to that library where it will be processed and ready for a cloud archival. A classic Disk to Disk to Cloud (D2D2C) scheme in action. Get the latest StarWind VTL package (version 8.0.0.12248 or newer) and install it on any appropriate physical, virtual, cloud server or even Veeam server itself. During installation, make sure to select the “VTL and Cloud Replication” option so StarWind automatically deploys the corresponding components. Specify a convenient path for the storage pool or leave it by default at disk C. Then, operating from the StarWind management console, connect to a desired server (use localhost or 127.0.0.1 when setting up an all-in-one scenario) and add a virtual tape device (drive) with as many virtual tapes you’d like. StarWind VTL emulates the actual HPE MSL8096 Tape Library, so all the principles of working with such a library will be applicable here. Note: You might need to install the latest drivers pack so that the server recognizes the said tape library properly. 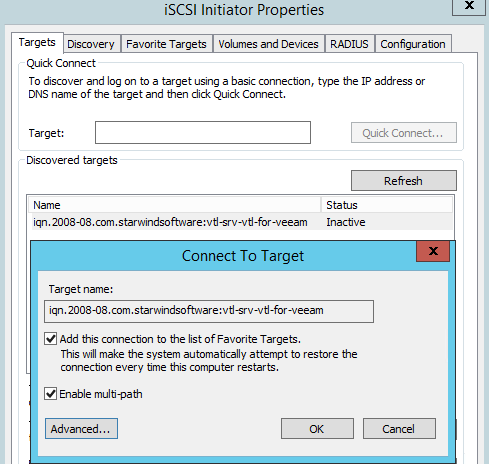 Once that is done, this server can be pointed to a VTL using the standard Windows iSCSI tools (control panel –> administrative tools –> iSCSI initiator). Go to Discovery –> Discovery Portal to initialize VTL and then connect to it from the Targets tab. Now you should enable a cloud archival via the cloud replication functionality: Simply select Microsoft Azure Cloud Storage on the first step, then specify the required Azure details from step #1, and finish the process by providing the desired retention settings. From a Veeam Backup & Replication perspective, you’ll need to add a server from above as a tape server to the VBR console. For that, an IP/DNS address and appropriate credentials will be required. During the procedure, Veeam will install a Transport and Tape Proxy services to the server and perform a tape libraries inventory if the option is specified. Once the tapes are detected and put into a Free Media Pool, it’s a good idea to create a dedicated Media Pool with some tapes, which will be used on another step. 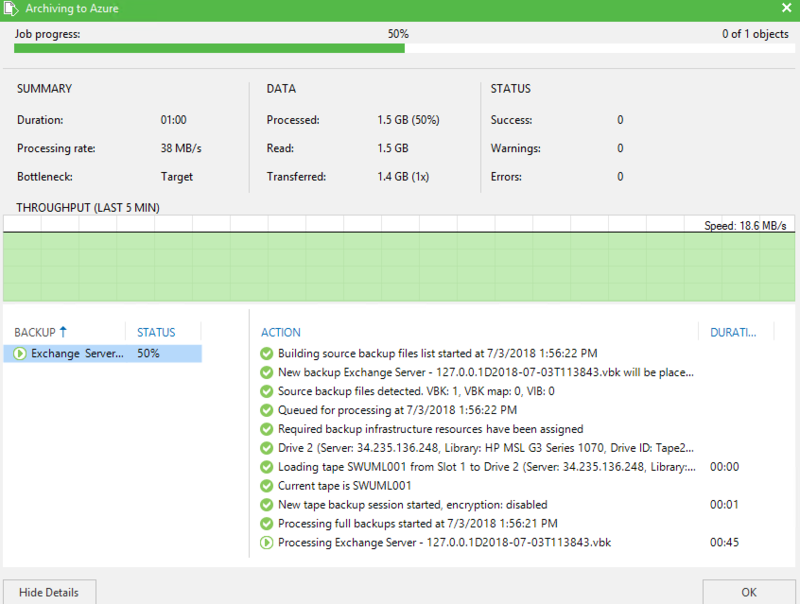 Now, Veeam is connected to VTL and can push the data there. Create a Backup to Tape or File to Tape Job, specify the backup scope (you’ll need some pre-created backups for the first option), and point the Job to a previously created Media Pool. Depending on the backup/file size, you’ll get the data effectively delivered to the VTL server. Figure 5. StarWind management console. Tape in Slot 1 has gotten a backup. Now you can switch to the VTL server and remove the tape from the slot if it wasn’t automatically exported upon the Veeam Job completion. Since in my case the cloud replication was scheduled to start immediately, I can already see the motion in progress. After a successful upload, the Cloud tab will get a blue check and I should be able to verify that by navigating to my Azure Blob Storage and seeing the actual files uploaded to this container. I can go ahead and manually change the access tier for any of those files right from the Azure portal. As an alternative, I could tweak the StarWind settings or even use PowerShell to manipulate the access tier in an automated way. 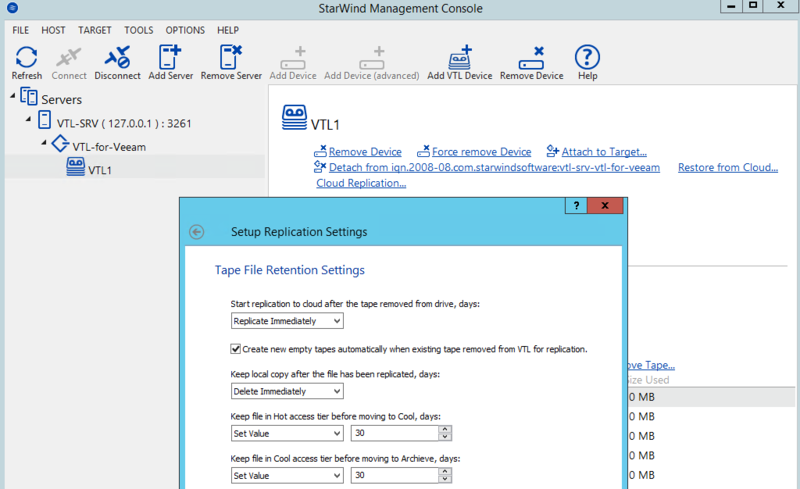 On the restore side, StarWind customers can initiate restores from Azure through their Veeam Backup & Replication console to recover the necessary files or VMs. Better yet, why not recover in Azure? Available in the Azure Marketplace, the virtual StarWind appliance, as well as Veeam Backup & Replication, can be installed in an Azure instance, and recoveries can be done from the archive storage directly into a new Azure virtual machine, accelerating your restore times and providing application portability across your backup infrastructure. In addition, you can provide access to these newly restored VMs in Azure with Veeam PN (Powered Network), establishing a secure connection back to your HQ data center or wherever you need to provide access to these workloads. Organizations are still using tape for a variety of reasons, but many want to take advantage of the cloud for their backups in order to maintain business continuity and unlock Availability. With Veeam Backup & Replication customers can leverage a seamless integration with StarWind to get their backups off site and into Microsoft Azure Blob Storage. To watch a full demo on the solution, you can watch this webinar.